New York: Will De Blasio Deliver for Working People? Bill de Blasio won the Democratic Party nomination for mayor in September and seems poised to become the next New York City mayor against a very weak Joseph Lhota, the Republican candidate. In the Democratic primary, De Blasio defeated City Council president Christine Quinn, who was earlier perceived as the main favorite to continue the policies of mayor Bloomberg and had secured the endorsements of the New York Times, Daily News and the New York Post. This signals the end of 12 years of a widely despised Michael Bloomberg in office. Bloomberg is now listed as the 7th richest person in the country with an estimated net worth of $27 billion (up from $5 billion in 2001). Five years after the economic collapse triggered by Wall Street and the deepest economic crisis since the 1930s, and after three terms of Bloomberg, a large section of the population of New York is seething with anger. In one of the most unequal cities in the world there is growing poverty, unemployment, and a deepening social crisis. For the elite, life has never been better. This can be seen in the skyrocketing prices of luxury real estate in Manhattan, where billionaires spend tens of millions of dollars for a penthouse, and the obscene profits made on Wall Street and by big business. But the majority of workers, young people, the working poor and students face an entirely different reality. Government statistics have shown that almost half (46%) of the population of New York City, the richest city in the world, is either “poor” or “near poor.” Much-needed hospitals in Brooklyn are shutting down, and a fund-starved public school system is failing hundreds of thousands of students, teachers and parents. Meanwhile police violence, surveillance and racist “stop and frisk” tactics have become a way of life for immigrants, working-class and minority youth. Which is the Real De Blasio? The two-party system in the city is heavily funded by the wealthy ruling elite and is dominated by the corporate mass media. It is a heavily-controlled arrangement, designed to produce media-sponsored personalities and candidates who can be trusted to represent the status quo. But beyond the citadels of the ultra-rich in Manhattan and better-off areas in Brooklyn and Queens, there is seething anger at Bloomberg and the ruling elite’s arrogance and the decaying, corrupt, political system. In the absence of a real working-class alternative to challenge the establishment, Bill de Blasio has tapped into the anger that exists among working people. His successful populist primary campaign spoke of New York as the “tale of two cities” — one for the rich and one for the poor. It called for “tax increases” on the rich and criticized the lack of affordable housing and decent jobs. He also denounced the hated “stop-and-frisk” police harassment. After attacking Bloomberg’s policies, a populist de Blasio, who was a distant fourth in the polls a few months ago became the front-runner, handily defeating Quinn and Bill Thompson in the primary. In a distorted way, his victory reflects the enormous pent-up anger that exists among the working class against Bloomberg and the rich elite. There are many illusions and hopes that de Blasio may end the Bloomberg era. The Nation magazine endorsed de Blasio in the primary as “reimagining the city in boldly progressive, egalitarian terms.” But these illusions are mistaken. Expressing more empathy and using more politically-correct and populist language compared to Bloomberg, whose statements reflected the extreme contempt of the ruling elite for ordinary people, de Blasio will very quickly show that his politics are driven by the interests of the same elite 1% rather than the 99%. Despite his populist statements, his roots are with the establishment, not the 99%. He will move to impose cuts and attacks on living standards of working people and the poor rather than make the elite 1% shoulder the burden of the crisis that their policies have caused. De Blasio is supported by a section of the establishment, including financiers and real estate developers, who think that a shift in political tactics is needed in order to avoid an explosion of anger from below along the lines we saw with Occupy Wall Street, as well as in Turkey and Brazil recently. However, rattled by the experience with OWS, other sections of the establishment are warning that de Blasio’s rhetoric amounts to “class warfare” and that workers may take these promises at face value. Recent articles and attacks against de Blasio warned that he supported the Sandinistas and described himself as a radical or even a “socialist” 30 years ago. They fear his populist message could open the door to mass struggle and demands of action against wealth and profits of Wall Street and the rich, in this the financial and cultural capital of the country. We need to remember that Obama promised so much, but instead presided over continuing wars, bank bailouts, and vicious budget cuts. Similarly mayor de Blasio will move swiftly to demand givebacks from public-sector employee unions. While posing as a “friend of labor” he will demand deep cuts in jobs, pensions, and health benefits in order to make city employees pay for the huge city deficits. At the same time, he may impose some slight tax increases on the elite ¬— in order to avoid a social explosion or massive angry strikes like that of the school bus drivers of ATU 1181, the Con Edison workers or the transit workers. Given his emphasis on inequality, it is also striking that he proposes raising the minimum wage only to a paltry $9 an hour — not the $15 an hour that the fast-food workers movement correctly demands. De Blasio is also raising expectations of a shift away from Bloomberg’s wholesale attack on public education, particularly through privatization, high stakes-testing and attacks on educators’ working conditions. In particular, de Blasio has criticized the destructive co-location of charter schools and the free ride they receive at taxpayers’ expense and even suggested the city doesn’t need more charters. Putting a halt to more co-locations or charging the charter schools rent for example would indeed be small steps forward. But this is far from guaranteed, especially given the ferocious opposition that will come from big business to any slowdown of the privatization agenda. Also, these steps would not undo the devastating damage that has been done in the past 12 years. Only a massive struggle by educators, parents and students can achieve that. Across the country there is anger and discontent fueling the revolts we saw in Wisconsin and the Occupy Wall Street movement in 2011, the dynamic Chicago teachers’ strike last year, the protests against the XL pipeline and fracking, and the spreading fast-food workers’ protests across the country. These struggles are only the beginning. There is an historic opportunity for the Left to build a serious movement in the streets and to run candidates across the country, using the campaigns as a platform to spread the movement. 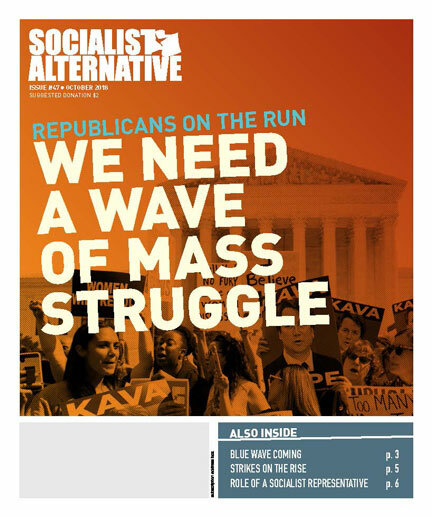 Socialist Alternative argued for “200 Occupy candidates” during the 2012 elections on the basis of a radical program that would challenge the political establishment and the two-party system that keeps working people disenfranchised. It is urgent that potential anti-corporate, anti-capitalist, and socialist candidates and campaigns begin to organize for 2014, especially where there is the potential to field credible candidates. In Seattle and Minneapolis, Socialist Alternative members are running as candidates for city council this November, and are receiving an extremely positive response (see articles in www.socialistalternative.org). Campaigns by other genuine left wing activists like Howie Hawkins of the Green Party, who is running for city council in Syracuse, also show the real potential that exists to build a genuine left wing alternative to the two-party system and capitalism. Campaigns need to bring together all those fighting against Wall Street and the 1%: anti-cuts activists, teacher activists, fast-food and low-paid workers, public sector unionists, socialists, community activists, immigrant rights activists, activists against racism and police violence, the radical environmental movement, as well as radicalized young people who are looking for a vehicle to express their anger against the system. Socialist Alternative advocates the creation of a new political party that rejects corporate money, opposes all cuts to jobs and services, and campaigns for taxing the rich, a mass jobs program, a $15/hour minimum wage, nationalizing energy and the banking system, ending wars and cutting the Pentagon budget, and for single payer health care and democratic socialist policies to challenge the sick system of capitalism. IF YOU AGREE, THE TIME TO GET INVOLVED IS NOW. This post originally appeared online at www.socialistalternative.org and is reproduced for the Socialist Alternative-New York City website.